Here at Halsey, it is our mission to continuously encourage and support school spirit. Last year, spirit week in September was a huge success! It was incredible seeing our staff and students coming together to help build a friendly community in our school. During Spirit Week, it was truly wonderful experiencing such positive and lively energy spreading all through our hallways and right into our classrooms. This year, we want to make sure that energy continues to flourish; not only for one week, but throughout the entire year. Therefore, Halsey will be hosting not a Spirit Week, but Spirit YEAR! 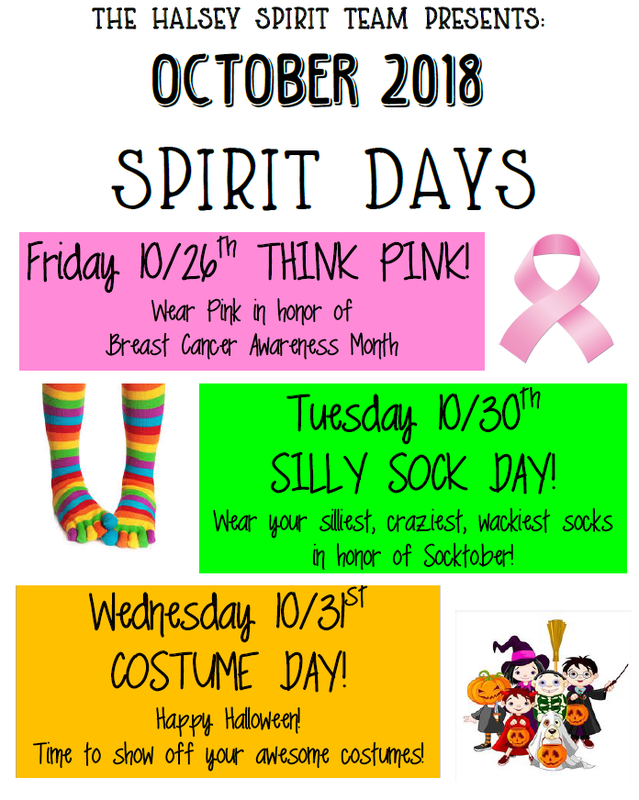 Each month, we will have two spirit days, allowing our school to spread school spirit in various, fun, and exciting ways. All through the month of October, Halsey will be collecting donations of BRAND NEW socks, hats, mittens, and gloves which will be distributed to individuals and families who are homeless as well as to our veterans. Please click the flyers below for more information!!! Did you know that Halsey has joined the fight against Breast Cancer? Please click the pic to see the flyer and learn how you can join Halsey in this important battle. NYC is also trying to make a difference so check out the below information and lets defeat Breast Cancer once and for all! The PTA conducted an election to fill a vacant seat on our School Leadership Team. Liz Fisher, parent of a 7th grader, has now joined the team and we look forward to having her involved on the SLT. Membership on the SLT is a 2 year commitment. We will be losing a couple of parents who will be graduating this year so if you are interested make sure you attend PTA meetings and watch out for the nomination process later in the school year. On behalf of the Executive Board of the Parents Teachers Association (PTA) of JHS 157, welcome back to school! Click the blue link to find our PTA Annual Appeal letter, hard copies were sent home with your children last week. Do not forget – 6th and 7th grade students who have purchased a photo package will be taking their pictures on Monday, October 22nd, 2018. On Saturday,October 20 from 9am-3pm Ms Shriki and Mr Blanco will be available to help any 8th or 9th grade families with their high school application. Anyone who is having trouble with myschools, anyone who needs access to a computer or who has not yet created their account and needs help should stop by anytime during the hours listed above. More dates for November will be posted soon. Join the NYC DOE Affinity Field Support Center for a conference for students with disabilities, English language learners, their parents, families, and school staff to help prepare for life after high school. Light dinner and refreshments will be served! Have you picked up your copy of “Achieve NYC: A Complete Guide to New York City Public Schools” yet? The guide is available in ten languages, and offers families an easy-to-read overview of the DOE’s policies, school- and district-level supports, and academic expectations for students. The guide also includes useful tips for supporting students at home, in the classroom, and during the college application process. Next Article Halloween at Halsey – This Wednesday, October 31st 2018!